Otero County Prison Facility is located in Chaparral New Mexico. It is privately run by Management and Training Corporation. The facility has a capacity to hold 1,089 inmates of low, medium, and high custody levels. 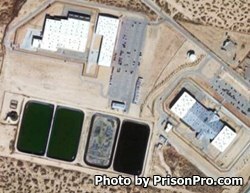 Additionally, this prison houses non-criminal male aliens for Immigration and Customs Enforcement. Otero County Prison Facility offers inmates work and training programs while they are incarcerated. Select offenders can work within the institution in supportive positions doing janitorial work, working in laundry, and helping prepare food for the various meals. Inmates can also participate in various religious services. The first step in visiting an inmate at Otero County Prison Facility is to fill out a visitors application and wait to be approved. Visitation occurs on Saturdays and Sundays from 8am-5pm.